I thrive off of lists. I’m normally all over the place wanting to do it all, so having a written list of broken down daily tasks keeps me grounded and focused. When we first moved into our house I would use this cleaning calendar. I wish I could give the creator credit but I can’t seem to find who it belongs too. 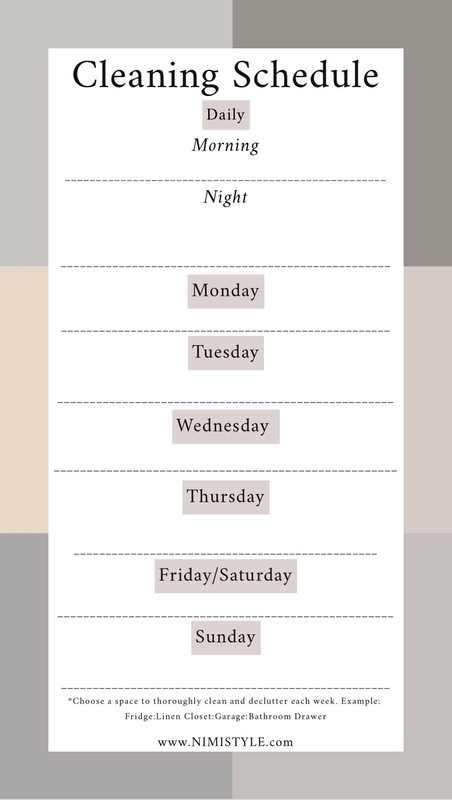 This is the calendar that inspired me to create one that works for my family. I like to have the house cleaned before the work week begins. This way I have less to worry about while home with my girls. We get our cleaning done after breakfast. I start by dusting the rooms and wiping all the doors and baseboards down. Hubby goes from room to room with our vacuum and he does a thorough cleaning- floors, windowsills, shelves, ceiling edges etc. Once he’s done I mop the floors and hop into the shower a.k.a clean that bathroom and then shower while hubby takes care of the other bathroom. My Mondays are all about cooking & laundry. Since the house was just cleaned on Sunday I do a couple of loads of laundry throughout the day. I air dry our clothes so i don’t put them away the same day. Monday’s are also the day I start decluttering a new space. I choose one area in my house to focus on each week. With my girls at home neeeding my attention decluttering isn’t something I can complete in one day so I literally just spend a few mins on it daily when I find a free moment. Having a dedicated space to work on helps keep me focused on really cleaning and organizing that one space, be it the fridge or a drawer. It’s gets my semi undivided attention. Since I cooked a few meals on Monday the kitchen won’t be getting a lot of use for a few days. I use Tuesdays to deep clean my kitchen. I clean the stove. My counters & floors get a through scrubbing along with my appliances. By the time Wednesday rolls around the clothes had a few days to dry. I get the bulk of our clothes put away with the help of my girls, but sometimes some get left behind and that’s okay. You can read about how I tackle laundry and use dump drawers to keep our clothes organized. Since washed clothes are coming up instead of putting the sheets away, I just change the sheets on the beds. I also do a light surface dusting of the bedrooms and run the roomba in each bedroom. Thursday I clean the bathrooms and put out new towels. My girls have swimming Wednesday night and they take the towels from the bathroom and bring them back drenched so perfect opportunity to take out a fresh set. Fridays are super busy for us since my parents come visit. I try to get the house presentable on Thursday for the weekend a.k.a clean bathrooms 😂. I also broom all the stairs down to the foyer and then run the roomba to pick it all up. I don’t do any real cleaning aside from our daily tasks. If my decluttering isn’t completed I’ll try to get it done on Friday otherwise we spend it with family or DIYing. Doing a little little bit everyday helps keep everything manageable. Some days I won’t follow this schedule to a T, but since I have a plan and something to work off of it’s easy to make do. Keeping our floor and surfaces clear of what doesn’t belong helps speed up the cleaning process. We use pending spaces and catchalls that get cleared away every night. You can read about how I deal with clutter and keep my home organized . Outsource, outsource, outsource. For the majority of my pregnancy and first few months of my littlest life I outsourced the cleaning. I still have someone come once every few months to deep clean. I would have continued outsourcing but I’m guilty of being really particular about how my home is cleaned so now that my littlest is almost a year I prefer doing it myself. 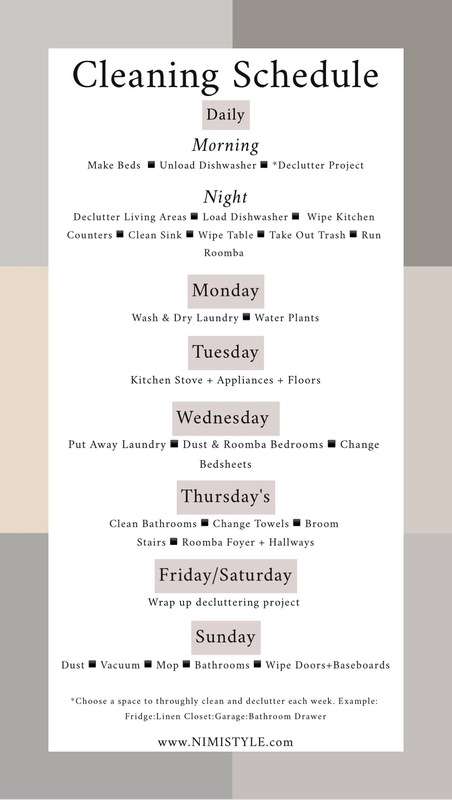 Im including a blank cleaning schedule that you can save and fill in with your own tasks!